Suited and booted, Headline come on from the left side of the stage, strutting linear, like a black version of Madness in Nutty Boy fashion. Headline march, march, march, chanting a deep baritone mantra: ‘Don’t knock the baldhead - Don’t knock the baldhead! Boongy boong boongy woongy! Don’t knock the baldhead!’ It’s an unforgettable entrance. They hit centre stage, and suddenly scram in all directions to grab guitars, microphones and drumsticks. Acappella out, in comes their schizoid mesh of pop-tinged Ska. 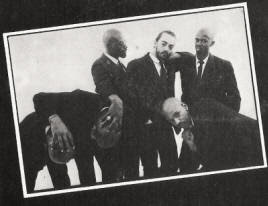 Black suits, black ties, white shirts, skanking natty dread – five black baldheads and one white guy. Lean lead singer Michael holds onto the mic stand as bassist Winston bobs about, tugging at his black Music Man bass, with Kevin skanking on guitar and synth-player Richard leering at the mob, playing bubblegum synth riffs, with knees-ups and Ska ‘chikka-chiks’ a-plenty. The crowd’s earlier coolness thoroughly thaws as "Rudi Don’t Fear" and "Highway Hassle" fill the theatre with infectious, insistent Ska - followed by "Bald Head Revolution", and a return to their single, "Don’t Knock The Bald Head". Below is a re-posting of an article from a Stranglers web site that includes an interview with Headline's bass player Winston Blissett that was conducted in 2006. These days he plays bass for ambient trip-hoppers, Massive Attack. Headline's 1980 LP is nearly impossible to find. Instead, here is video of Bad Manners performing a cover of "Don't Knock The Baldhead" which has become a mainstay of their live set. Is this where Buster Bloodvessel nicked the Don't Knock the Baldhead phrase or is it the other way around? 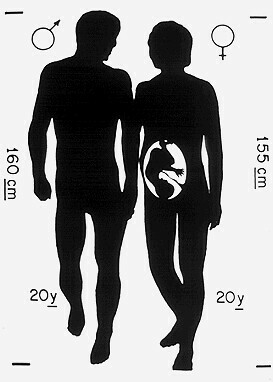 Just wondering. Oops. Ignore my earlier comment. I read the article a little more closely and my question was answered. Thanks. BAD Manners Give Headline a mention on the back of their 2nd LP Loonee Tunes that's how I first got to hear about them. 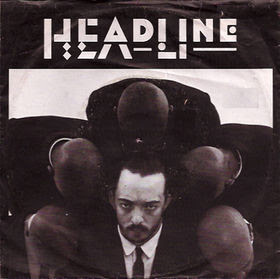 I have a copy of Headline's LP and I am looking for a copy on Cassette if one was Released because the Vinyl I have is not in Bad condition. Glad you found my Headline feature. Thank you also for the big-up for www.strangled.co.uk. We got a new JJ Burnel interview in the pipeline, as a bassist yourself, you no doubt know of the man, the myth, the maninblack! Just reading one or two of your other blogs - the one about Black Slate is great. I actually lived in the same apprtment block as the drummer. Must have been 1984-86. Nice chap indeed. speaking as the only White guy in the band, think its about time Headline put some more tunes together. Dont you?? I saw Headline at (I'm not sure, it could have been The Rainbow?" where they supported the Stranglers. We booed them for the first couple of minutes as was the tradition at Strangers gigs, but then we all got into their music! After their set, we didn't want to let them go! A really amazing band, and one i'd watch tomorrow. Don't knock the bald head!!! Jon S.
Yup - also saw Headline supporting the Stranglers at either Blackburn King Georges Hall or Manchester Apollo. The former I think. The thing is, Don't Knock the Baldhead has been banging around in my head for over 30 years. I never associated it with Bad Manners; I wasn't a fan of Bad Manners and only found out today that they'd covered it. I was curious about Headline but could not for the life of me remember the name. I remember them being thought of as very, very good and an unusual choice of support band.